Eyes On ROH: Should The Hardys Stick Around? 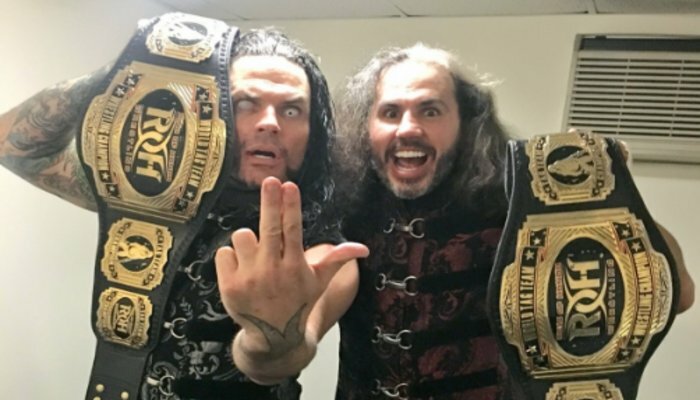 As of this writing, Matt and Jeff Hardy aka Broken Matt and Brother Nero are the Ring of Honor Tag Team Champions. 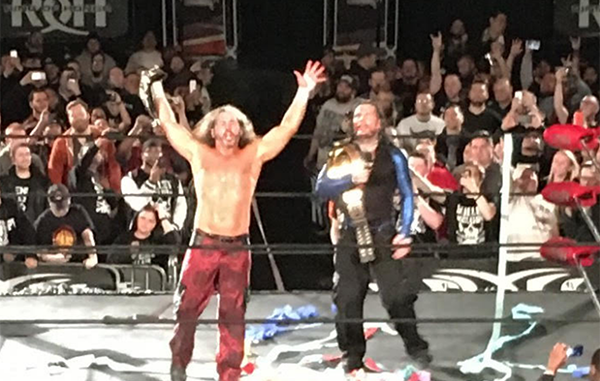 After making a surprise appearance at Manhattan Mayhem, where they defeated the Young Bucks, the Hardys turned the wrestling world on its head and continued their tag team dominance over the indie wrestling landscape. Though they didn't lose the TNA tag team titles, apparently new champions will be crowned for TNA, as the contracts of Matt and Jeff have expired. Regardless, to see Matt and Jeff together in Ring of Honor is special. They were reportedly in talks with WWE to return, but one would expect those negotiations to be longer than usual considering what Matt wants: creative freedom. Matt put in a large amount of work to make his Broken Matt character get over and now that he has, he should keep the momentum going. There's so much more to accomplish as Broken Matt and I think he has the perfect opportunity to complete the journey in Ring of Honor. A return to WWE would only stop his creativity and reduce them to the same old Hardy Boyz role they had for many years prior. Don't get me wrong, the money WWE is probably offering is amazing, but the freedom to come and go as you please, work other dates in the indies, and earn top dollar in the industry is priceless. 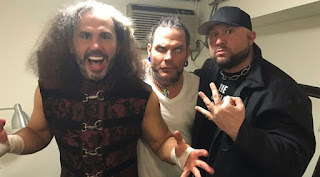 While there are some great feud possibilities in WWE for Matt and Jeff like Bray Wyatt, AJ Styles, Seth Rollins, Dean Ambrose, Finn Balor, and more, there is also a number of feuds for the Hardys in ROH that could help the company grow. Let's look at some of the upsides of staying with ROH for the two wrestlers. -As I mentioned, you could very well have the freedom to do whatever you want in the indies and what better way to maintain that than to stay in ROH and keep building the company back up. The freedom he would have on the indies would disappear in the WWE for sure and we might lose the brilliance that is Broken Matt and Brother Nero. A return to being the "Hardy Boyz" just doesn't seem as appealing as having full creative freedom. 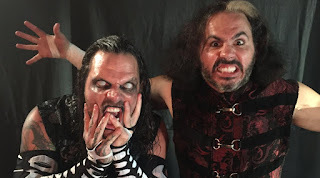 -The Hardys can face a number of solid teams and makeshift teams in ROH, allowing for some great wrestling. ROH puts on consistently good matches so we could see The Hardys vs The Briscoes, The Hardys vs Young Bucks in a series of matches, The Hardys vs War Machine, The Hardys vs Jay Lethal & Lio Rush, The Hardys vs Adam Cole & Cody Rhodes, the possibilities are endless. The tag team run could honestly be something fun and engaging for not only the fans, but Matt and Jeff as well. -I think with the debut of Bully Ray in ROH, there's a chance for Matt and Jeff to provide true veteran experience to the company. Their style of wrestling fits within the ROH landscape, and the list of feuds and matches that could come from this are endless: Jeff Hardy vs Jay Lethal, Broken Matt taking on the Bullet Club and Adam Cole, Matt vs Cody in an interesting, Jeff vs Lio Rush, Jeff vs Daniels, Broken Matt vs Daniels, and even a 6 man tag match where Matt, Jeff and Bully Ray team up to take on the Bullet Club. I'd love to see Matt in a ton of these matches and feuds, because I feel they could bring more character to ROH, something they are desperately in need of. This could be mutually beneficial for the both of them. -This is the biggest one. Matt attempted to do something for TNA and it worked. He put more eyeballs on the product again, and himself. Even people who hate TNA (myself included) paid attention to what Matt was doing. Could Matt bring his "Ring of Deletion", his "Deletion With Honor", or whatever he needs to ROH? He could help revitalize ROH in more ways than one, and I'm 100% on board with Matt and Jeff both sticking around in ROH. I get that going back to WWE would likely signal that they're probably done in wrestling after the contract expires, and that's another reason why I hope they stick with ROH for a while. It not only keeps the company interesting, it makes for entertaining TV. So, please Matt and Jeff, stick around in ROH, work with some of the top notch talent. But most of all, DELETE all who oppose.